Update: Price now confirmed by photo of poster at D-Street!! 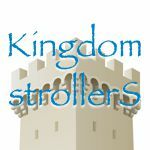 Update: 6/1/11 On Facebook, Kevin from CA, confirmed a price tag of $11.95. We assume that the price will be the same here in Florida. Once we get visual confirmation, we’ll let ya know! This is cheaper then I expected with all the extra vinyl, what do you think of the price tag?? 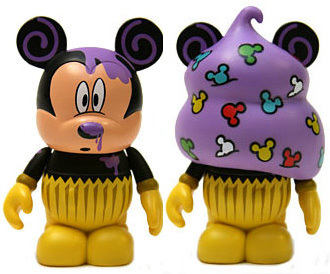 Update: 5/19/11 Disney has announced a release date of June 3 at D-Street FL and CA. 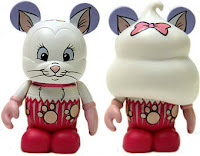 They also released pictures and an exciting reveal. 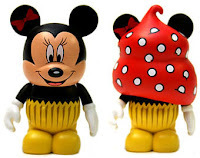 As some people have predicted, the icing is removable revealing the character’s head inside. 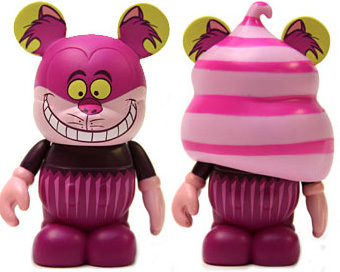 Right now, we only have a picture of the Mickey with icing off, but they also released pictures of Cheshire Cat and Tinkerbell (see below). This set will be sold in open window boxes and was changed from being limited edition to an open ended production number. 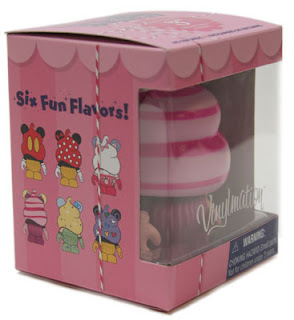 Update: 4/20/11 While looking at the Disney Vinylmation Vault today I noticed that they added Bakery to the list. This usually means that it’s out already, or that it’s really close to release. What do you think? Might it be out in a foreign Disneyland or will we get a surprise on Friday? Also we now know the artist is Susan Foy. Update: 4/9/11 After a discussion in line at D-Street we pondered if the icing would be removable. Check out the discussion at Cute on the Inside? 4/7/11 How awesome is this? Today Disney added a sneak preview of the Bakery set to their Sneak page. And get this, The Mickey, Minnie, and Cheshire Cat look exactly like MC artistically rendered! First, they were cupcakes with frosting, like we imaged, and then they look very very similar! So check out the whole set, designed by Susan Foy, and let us know what you think! Straightforward, but kinda cool. 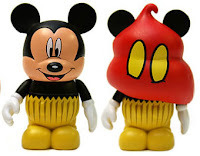 We don’t have many straight forward Mickey heads, so this will be nice. Also simple in design, but perfect in execution! “Lots more detail here, but I surprisingly am starting to like this Bakery set.” – M.C. I wonder how they plan to do the icing? It looks like some kind of add-on that covers the entire head! I love cupcakes and I love this set. I am guessing it will be an open window set. I can’t wait, finally a set where I want hem all. If the final designs turn out as cute at the art I’ll definetly pick up a set of these. 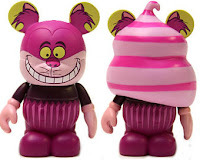 I hope yall are right about the frosting being like a removable mask, if that’s the case then I’ll have to pick up a couple of Cheshires, he’s one of my wife’s all time fav characters. Interesting concept. Like some of the comments above, I’m curious as to how they’re going to create it. I look forward to more information. Disney, you HIT one out of the park. Cupcakes which I LOVE and the OLD MOLD!!!!!! 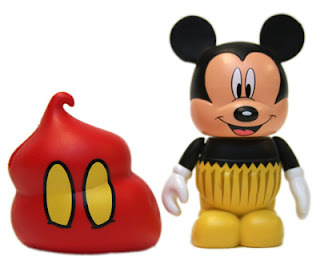 I sure hope this is sold at disney stores too. I am going to Destin at the end of June and I don’t think I can convince my wife to drive 6 hours to D-street to pick these up. I want the ENTIRE set! Great looking set!!! Old mold..even better! I love the confetti Mickey. Great set- a little disappointed they did another Marie design- not a big fan of that character. I wish they did a bigger set with more characters. This seems like one of the smaller sets they’ve done in terms of the number of designs there are. Love the confetti Mickey. y would u put another mickey y not stitch or any other chacter????????????? These looks really neat in person. Can’t wait until they come out–anyone know about the release date for these???? I love these and i really need at least one. Price seems fair. after nerds… didn’t know what to expect. Like them a lot. will get all 6. I think the price is Perfect. Thougfht they’d be more $$. 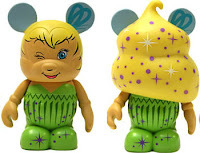 I think the only Fail here is Tink. She looks chunky. I will still need to by it due to Tink being my Daughters Favorite. are these going to be released online?